Excavation Services in Aventura that you can always rely on are only one phone call away. Our expert staff at XS Trash is ready to assist you with all of your excavation needs. We offer competitive rates, reliable services, and a team of professionals ready to work hard for you. Our business if fully licensed, insured, and bonded. We aim for 100% customer satisfaction and your complete satisfaction is very important to us. Do not hesitate to make any special requests. We will do everything possible to accommodate you. You will be our top priority when you hire us. If you are happy, we know we have done our job right. Our past customers have been very pleased with our work, Our team of experts will always arrive to your property on time. Searching for excavation services in Aventura that are reasonably priced? At XS Trash our prices are better than many of our competitors. 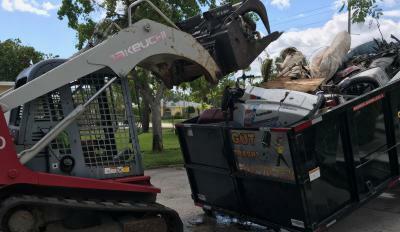 In addition to our excavation options you can also choose to use a bobcat operator, who is fully licensed, to operate the bobcat and work on your property to remove junk. You will be very impressed in how fast and efficiently they work. Excavation services in Aventura are not limited to having only one item removed. Our team of experts can remove an entire truck filled with junk, or even make several trips. We use really long trucks which are 21-yards long to remove your junk with. Just let us know what needs to be removed and we will make sure it gets done. Contact us today to schedule a free quote! Our excavation services in Aventura should fully satisfy your needs. If you are not happy, our job is not fully done. We use environmentally friendly ways to remove your junk with so you can always feel confident hiring us. We are very Eco-friendly! We will dispose of all of your items carefully and without harming the environment. Schedule your cleanup today!